The excellent feedback we received on our worksheets for kana & kanji encouraged us to start with the NIHONGO ICHIBAN PRINT YOURSELF workbook series. Download the pdf ebooks and print the worksheets as often as you like on your own printer. Flashcards are the most popular way of learning Kanji besides repeatedly writing them. These flashcards are very well designed to prepared for the different levels of the Japanese language proficiency test. The cards are varnished with rounded corners to ensure high durability. This workbook includes the 46 Hiragana as well as the 46 Katakana. Each character has one dedicated page showing its reading, the stroke order as well as a large section to practice writing. Click on the pics to enlarge the preview and see the sample pages. 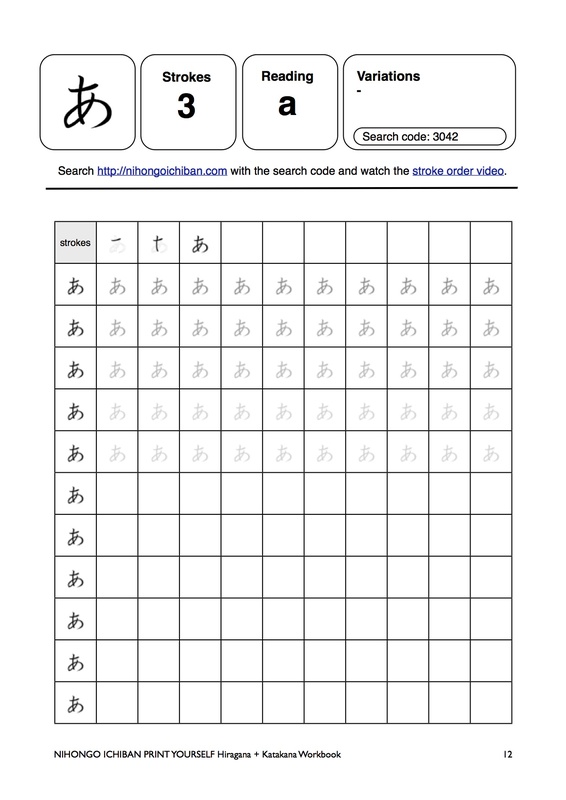 Download it for just 500 Yen (about 6 USD) and start printing your worksheets to practice writing as often as you like. We donate 10% of the book’s revenue to Ashinaga – a NGO that promotes education for orphans in the world. The Hiragana Times is a Japanese magazine very useful for those who are learning Japanese. Indeed, the articles are written in English but followed by the Japanese version. It is a very good way to practice Japanese no matter your level. On one hand, beginners will learn lots of vocabulary and get used to reading in Japanese without having difficulty since the kanji have furigana. On the other hand, advanced speakers will be able to practice regularly their Japanese. The articles are very different and cover from cultural facts to business and politics themes, stories of foreigners living in Japan and tips on traveling are also published. There is a digital version of the magazine which you can read on your computer or print at home, some articles also have an audio version that subscribers can download to practice listening. It is a very good way to improve your Japanese skills and discover more about Japan and its culture at the same time. there’s the download link ??? Thanks for your interest. It took a bit longer than planned but the shop is up now and the download links have been activated. i recently bought this e-book to refresh my Japanese. it is very useful for anyone who wants to revisit the fundamentals of writing Japanese characters, or anyone who is beginning to learn the language. Very affordable and it provides loads of practice. Good buy! Ummm….does the subscription to Hiragana Times include any back issues that might have been published? If not, is there a way we can get those back issues? I just think the more I can get and read the better I can understand Japanese….